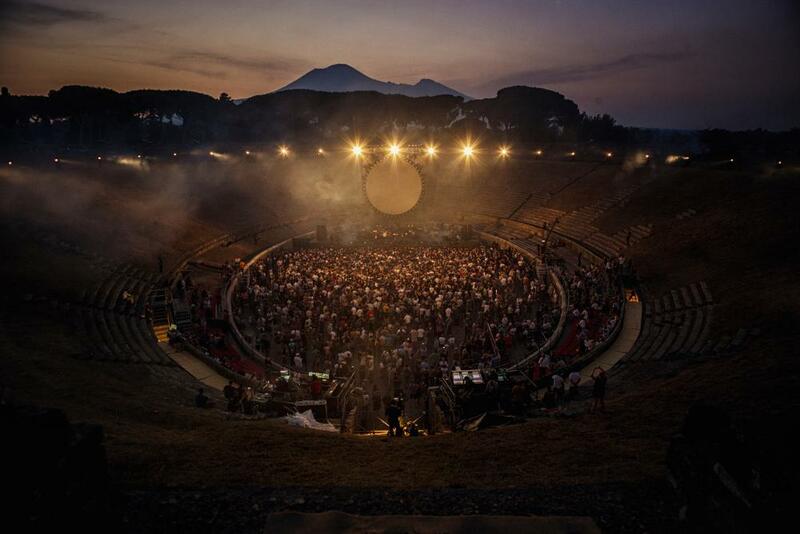 As you may have heard, during his 2016 Rattle That Lock tour, David Gilmour returned to the ancient Roman amphitheater at Pompeii where Pink Floyd played in 1971, where he staged two days of concerts that were recorded for video release. After being previewed in theaters in mid-September, the video package was released on September 29th. There are several formats available, including everything from CD to DVD to BluRay to digital download and several combinations thereof. By way of explanation, David brought in an historian who explained that the Roman’s didn’t even call their theater an “amphitheater” but instead called it a “spectaculum,” a place of spectacles. For this video, David brought back that element of Pink Floyd’s performances that he had drawn down on in the last two videos: spectacle. Think of this as a melding of the1994 Pulse concerts and his later solo concerts. This time, rather than performing his latest solo album in its entirety and then adding a few Floyd tunes, Gilmour has blended the old and the new and has brought back the theatrical lighting design that Pink Floyd were known for. The feel is BIG, as is the band. The band is a hybrid because several of David’s regulars had scheduling conflicts, with some of them going to former colleague Roger Waters’ tour. Veteran sidemen Chuck Leavell and Greg Phillinganes dropped in and served marvelously on keyboards and vocals. Session guitarist Chester Kamen performed on guitars and vocals. David brought in a background vocal trio with two gals and one guy, Louise Clare Marshall, Lucita Jules, and Bryan Chambers. All are excellent. Multi-instrumentalist João Mello contributes sax, guitar, vocals, and keyboards. Regulars Steve Distanislao (drums, percussion, vocals) and Guy Pratt (bass, vocals) anchor the rhythm section. How is the music? Excellent! David’s voice is the strongest I’ve heard since Pulse. His guitar work is smoother and more integrated than it was on the previous tour. Those who follow Gilmour’s guitar sound know that he veers back and forth between relatively clean and relatively dirty sounds. On this round he’s gone back to his large, rack-based pedal board and his guitar sounds tend towards the clean or smooth side. He’s got three(!) B.K. Butler Tube Drivers and a Big Muff Pi on his board instead of the Pete Cornish units he used on the last couple of outings that seemed a bit more harsh and raw to me. Yummy! His improv has taken on a bit of Joe Wash’s character: Sometimes he starts a lead line and you think, “Is he going to be able to land this thing?” He always does. Though historically shy and retiring, this time he appears much more relaxed onstage, smiling often. David shares vocal duties throughout the band more than he has before. In the documentaries David lets us know that they recorded the first night’s show and thought, “Wow! We Nailed it!” Then after the second night they felt everything except a few bits and bobs was even better on that second night. So that is what the video represents: the second night’s show with a few cleanups flown in from the first night. It also represents a complete show minus only one song that was included in the bonus performances. There are also some interesting twists here: Gilmour decided to shake things up a bit, mildly altering some arrangements as well. If you are set in your ways and only want to hear a reproduction of the original recordings, stay away. For instance during rehearsals, David’s background vocalists quietly went off in a corner and created a three-part harmony version of Claire Torrey’s famous vocalizations for Richard Wright’s song, “The Great Gig in the Sky” from Dark Side of the Moon. When they were finished, they approached David and asked if he would perform the song once during the tour. He chose to feature it prominently in the Pompeii set next to the song he and his wife, Polly Samson wrote about his friend and Pink Floyd colleague, Richard Wright, as a tribute. I found the interpretation to be delightful. How about recording quality? As I have watched David’s audio team handle his solo albums and videos for the last couple of decades it has sometimes seemed as if I was also watching them grow into the job. This time it really feels like they dialed things in. The bass is strong and full, the mids are clear, and the highs are delicate. They’ve avoided midrange buildup so the overall sound is extremely clean. The stereo mixes spread nicely across the sound stage and seem more solid and deliberate than a simple fold-down automatically generated by a plug-in. There are enough dynamic range and transients to present listening fatigue. It is a pleasure to listen to the video concert and the CDs on both my large, monitor-based surround system at home and on the big monitors in the control room at work. And the spectacle? In an interesting reversal, the audience was placed on the floor of the amphitheater while the perimeter of the stadium and the spectator galleries were illuminated with lighting, lasers, effects, and pyrotechnics, turning the amphitheater itself into a prominent character in the video. David also brought back the huge circular Pink Floyd projection screen rimmed with Varilights, above and behind the stage. There are new projection movies blended with the classic ones to illustrate the pieces, intercut with projections of the players during the concert. The concert video is shot with multiple cameras including drone cameras. The drones give you the overall picture when the effects get really big. In those moments you can also see David and the band, and particularly drummer Steve Distanislao, look up and grin as the pyrotechnics go off, enjoying being in the moment. I bought the boxed set containing two CDs, two BluRay discs, a booklet, postcards, and a poster ($50.99 at Amazon). Unfortunately it didn’t come with “Autorip” so I had to rip the CDs into iTunes manually. I’ve worked my way through all of material including the concert as well as the bonus South American performances and documentaries. By the way, the audiences in South America are phenomenal – passionate and energetic and yet polite, and made up in a very large part by teens and twenty-somethings. Remind me that I’ve got to play there sometime. In the documentaries we discover that David needs a hat at outdoor sound checks or his thinning pate will burn. We also find out that David and Polly like “Char Dogs” (hot dogs) that they find in street diners in Chicago and New York. The plan for this tour was to find beautiful, unique, historic, and interesting venues for their concerts. If you’ve done large-scale productions you begin to discern that David runs an interesting and pleasant tour organization. There are hours of extras and documentaries and they are actually recorded and mixed well! We also learn that David’s approach to performing is diametrically opposite Don Henley’s: while Don admits he spaces out and thinks of things other than what he is doing on stage to cut the boredom, David feels a sense of responsibility to feel the lyrics and music and to be in the moment as much is possible. So, I’m pleased with the content and quality of the concert alone and with the deep dive of the background material as well. 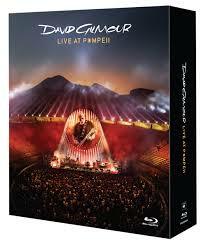 If you are interested in David Gilmour and his solo work and with Pink Floyd, this package could serve as a great historical gateway to both the new and old material. If you like David’s work and are comfortable with a little change, I bet you’ll enjoy it as well. Otherwise, there are individual DVDs or BluRays as well as a two CD set available. Enjoy!